In my three years with the aquarium several manatees came and went out of the exhibit space and the hospital back areas, particularly several dozen orphaned calves. As you might expect, orphaned manatee calves are delicate, require constant care, and they don’t always thrive well enough for eventual release back into the wild. Amber was quite the exception. She came in from Blue Springs State Park to SeaWorld Orlando several years ago after her mother and twin sister left her behind at the freshwater spring. While manatees do occasionally give birth to twins, the females as a rule only care for one offspring. It’s thought their relatively low-energy diet only allows them to sustain a milk supply for one calf. Amber was rescued by SeaWorld at 68 pounds and 3.5ft in length. 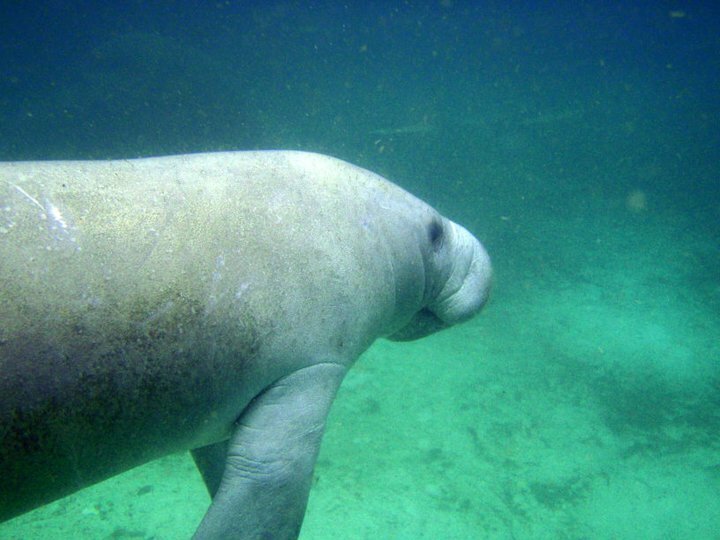 For several months she was nursed on a replacement milk diet by the staff, then coaxed onto romaine, spinach, and lettuce, and finally received the go-ahead after several years from Florida Fish and Wildlife for release back in February 2009. While Rita, the much older manatee released at the same time didn’t make it, Amber has steadily adapted to her wild environment in central Florida’s lakes and marshes. She sticks primarily to the Blue Springs area, Lake Woodruff, Lake Dexter, and the outflows of the St. Johns River. She’s frequently seen socializing with other manatees, including several other SeaWorld-veterans, and at some points she’s also been mating with these other manatees! In January 2010 we suffered weeks of extremely cold weather in Florida forcing rescues of several manatees and hundreds of sea turtles around the state. At that time Amber gave birth prematurely to a calf that ultimately did not make it. Luckily, not too long after she successfully mated again and brought the latest pregnancy all the way to term (about a year). Amber showed up to Blue Springs State Park last week with a brand new calf, born on June 13th! I’m very excited about this birth announcement and I know SeaWorld, the Manatee Rehabilitation Partnership, and Sea to Shore will all share a certain sense of pride and cautious optimism about this new life. Keep your fingers crossed that Amber’s natural maternal instincts can kick into full gear and raise this calf. Oh, and if you happen to be a central Florida native, get in touch with me if you’re interested in volunteering to help watch Amber and her calf in the busy spring. As an orphan that grew up around people she’s not shy about approaching visitors.. not exactly a good thing! State park personnel, as well as all the marine conservation groups involved, want to assure that Amber can bond with the baby through the first few critical weeks in a safe and calm environment. Posted in conservation, marine mammals | Comments Off on Amber is a Momma! I won’t lie, we’ve got a few more negative stories up on the block for this week so if you – like me – haven’t even yet recovered from reading about sharks being hacked apart then I think you’ll enjoy this break from reality and into cuteness brought to you by the folks at the Indianapolis Zoo, who have a brand new bottlenose dolphin calf. The keepers got fantastic video including shots of the calf nursing underwater (see 0:54 – 0:58)! Enjoy! Shedd Aquarium in Chicago welcomed a tiny Pacific white-sided dolphin calf to its pools just in time for World Ocean’s Day next week! (Aquarium and zoo types call this species “Lags” as a short form of their genus name.) The little tyke is actually quite large – about thirty pounds and three feet in length – compared to his mother. I worked around marine mammals and cetaceans for several years in a spot that routinely had pregnant and laboring females and always missed the births. They go pretty quick once you see those little tail flukes present themselves! Shedd did a lovely job capturing the event on film for everyone to see. Speaking of World Ocean’s Day, will you be anywhere near Washington, DC on June 7th? The Smithsonian will be hosting a splash event at high noon exactly so hightail it there if you’re curious to learn more!